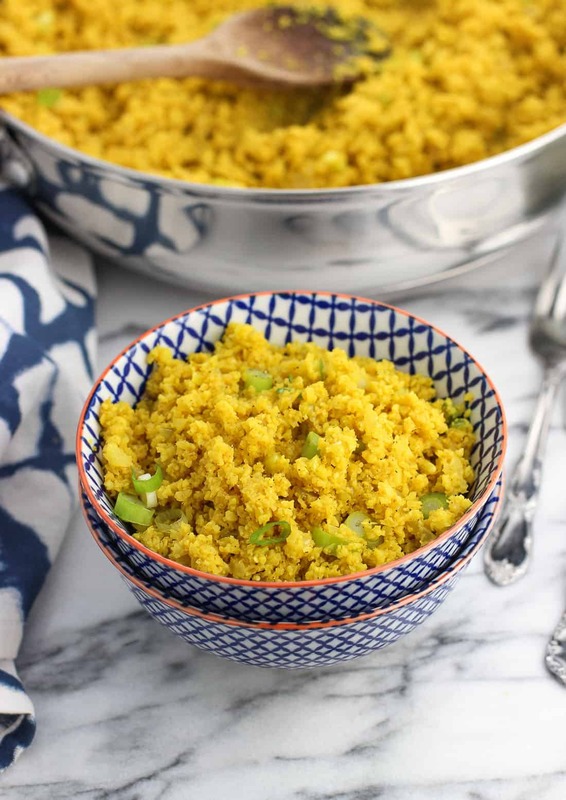 Ginger turmeric cauliflower rice is a healthy side dish that’s not lacking in flavor! Fresh ginger, garlic, and turmeric flavor this easy low-carb and lower-calorie recipe. Serve alongside chicken, fish, tofu, or your favorite protein, and top with the herbs of your choice. 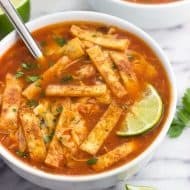 I’m feeling like I should make a confession, which will sound kind of silly given that I share new recipes on the Internet twice a week (usually! ), but I get stuck in some serious side dish ruts. For instance, let’s take asparagus. We love asparagus a LOT in my house and like to branch out (like the time when I made shaved asparagus and threw in some bacon for good measure), but I’ve found most often I go into auto-pilot after I bring home a bunch from the store and immediately make this impossibly easy but delicious spicy stovetop asparagus. Sometimes we make it on the grill if that’s how we’re cooking dinner, but still. Same spices, same sriracha, same deal. Just about every time. Cauliflower falls under that umbrella, too. 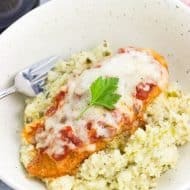 I began my cauliflower rice journey keeping it super simple – just olive oil, salt, and pepper, but that all changed when I made this Parmesan pesto cauliflower rice. Now whenever I buy cauliflower I automatically pick up basil as well, because what’s riced cauliflower without basil pesto sauce and Parmesan cheese? This time however, I’m switching things up. One of the most popular recipes on this site is turmeric coconut basmati rice. After getting a few comments from inquiring minds wanting to know if cauliflower could be subbed in for the basmati rice in that recipe, I thought to myself a) that sounds delicious, and b) doing a straight substitution in that recipe would likely yield soggy turmeric cauliflower rice from all the liquid. No bueno! 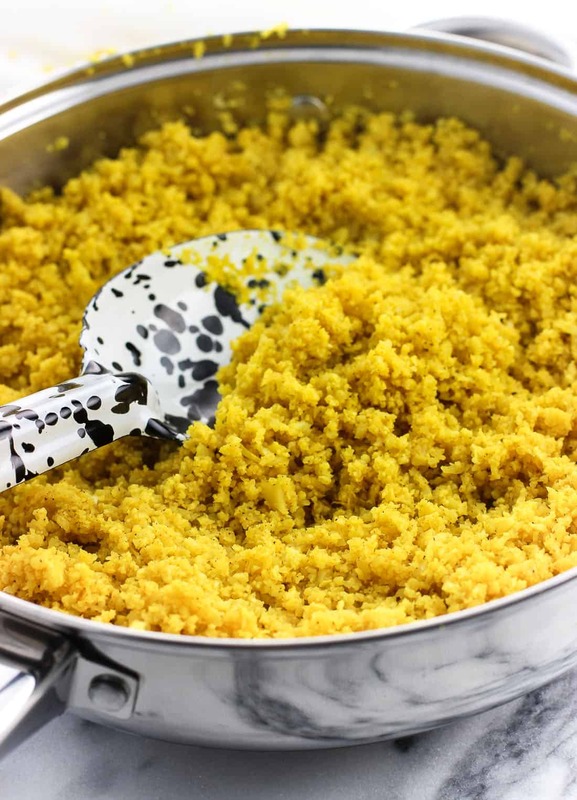 So here it is – ginger turmeric cauliflower rice. 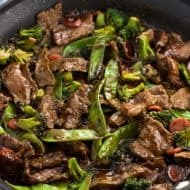 Just as vibrant and flavorful as its inspiration, but low-carb and lower calorie to boot. I won’t be one to tell you that cauliflower rice is just like rice rice. Because, well, it’s not. While the resemblance isn’t far off, you probably will be able to tell that you’re eating a healthier version of rice. 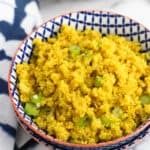 However this turmeric cauliflower rice has other stuff going on, like a fluffy texture that isn’t soupy or soggy and a bright flavor (and color), that result in it being a satisfying and delicious side dish all the same. Some recipes will call for using the riced cauliflower raw, but I prefer it when it’s sautéd. I find just a short sauté time mellows out that “raw crucifer-y” flavor. Definitely worth the little bit of extra work! 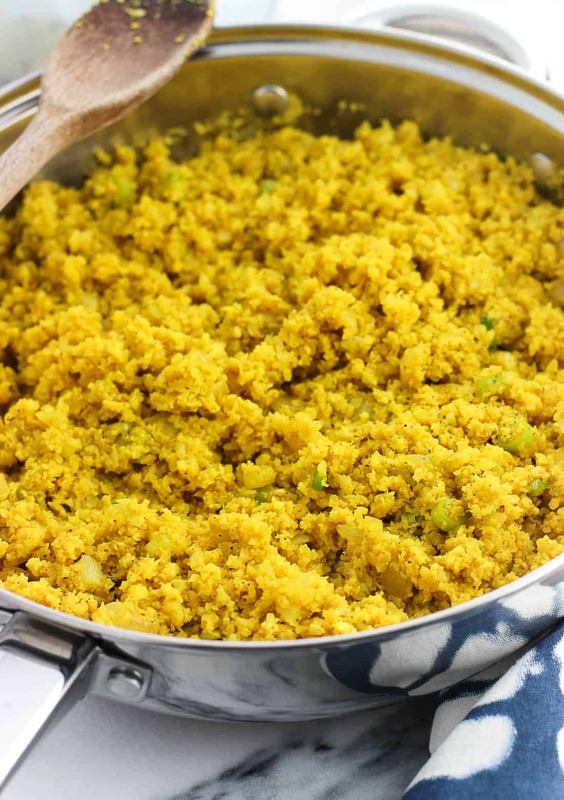 Once all of the ingredients in this ginger turmeric cauliflower rice are mixed up, the sky’s the limit as far as toppings and extra flavors. A drizzle of sriracha will make it spicy, and you can top it with whatever herbs you like – parsley, mint, basil, etc. All would be compatible flavors. Slice the cauliflower head into four quadrants, and then cut out the central stem in the middle. Break or slice the florets into smaller pieces and place them in the bowl of food processor. Pulse until the cauliflower florets are broken up into tiny pieces similar in size to rice. 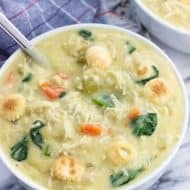 Depending on the size of your food processor you may need to repeat this process more than once until all of the cauliflower is processed. Set aside. Heat 2 tbsp of olive oil in a large skillet over medium heat. Add onion, garlic, and grated ginger and cook, stirring occasionally, for 5-6 minutes or until the onion is golden. Once done, remove everything to a plate and set the skillet back on the stove. Heat remaining 1 tbsp of olive oil in the skillet, set back over medium heat. Add cauliflower pieces to the skillet and stir. Add turmeric, salt, and pepper and stir to combine evenly. Cover and cook for 5 minutes, stirring occasionally, until the cauliflower pieces have become slightly tender and softened. Add sauteed onion/garlic/ginger to the skillet with the cauliflower rice and stir to evenly combine. 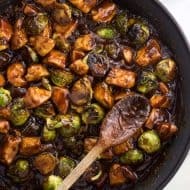 You may wish to keep the skillet over medium heat for a few minutes to reheat the onion mixture. Serve with parsley, green onions, or your favorite herbs for garnish. I’ve never tried any kind of cauli rice before, as I’m usually VERY late to the party with these sorts of things! Your ideas sound wonderful. I’m a big fan of pesto, and this turmeric ginger version sounds so tasty and wholesome. Cauliflower rice, where have you been all my life? 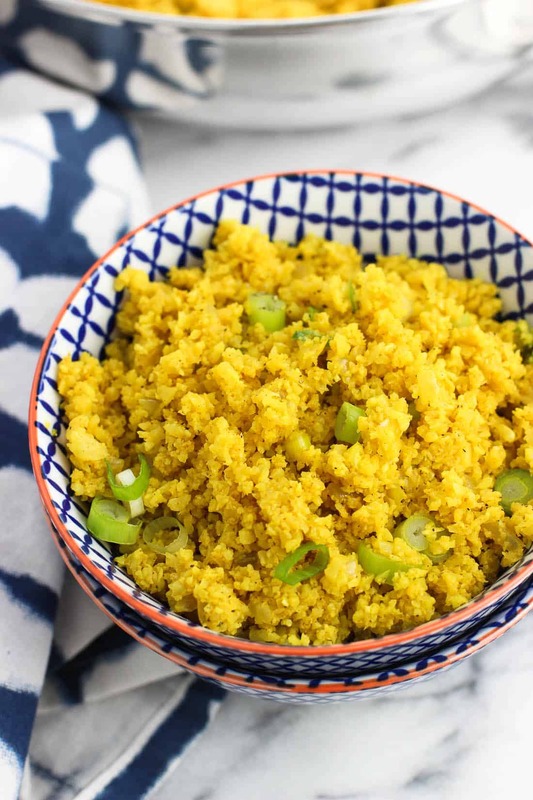 I have never made cauliflower rice, but am loving your recipe and will definitely try it soon !